Performance anxiety (also known as situational anxiety) relates to any situation in which you feel anxious when performing. This doesn’t exclusively mean performing in front of an audience or crowd, as it can apply to performing a relatively simple task in public. This anxiety usually stems from a belief of not being able to perform the task adequately, and then being judged negatively by others as a result. Performance anxiety is a common condition, which is often classified as a social phobia. Performance anxiety or ‘stage fright’ can affect a wide array of people, including; surgeons, actors, athletes, students, pilots, and public speakers. While most people will feel a level of anxiety when performing in public, for those with performance anxiety, this trepidation is intensified to the extent where the performer is intensely mindful of humiliation, embarrassment, and public scrutiny. This fear can cause the sufferer to freeze, making them unable to perform the task at hand. Performance anxiety has led some sufferers to abandon successful careers. In other cases, sufferers may choose to self-medicate with alcohol or recreational drugs. Anxiety can be caused by various conditions, such as panic disorders or post-traumatic stress disorder. If these symptoms occur on a regular basis or if you are unsure as to what’s causing your anxiety, speak with your doctor. How is Performance Anxiety diagnosed? A small amount of anxiety usually doesn’t cause any problems for most people. For others during stressful situations it can be more severe. Anxiety due to a stressful situation or task is normally suitable to slef-diagnose and treatment for occasional situational anxiety is normally appropriate for most sufferers. To ensure you are appropriate for treatment of performance anxiety online, your symptoms should be short-term and only occur occasionally in response to stressful or pressurised situations. Long-term or severe anxiety however, can potentially lead to more serious health issues, such as hypertension (high blood pressure). If you are constantly feeling anxious, or if your anxiety is affecting your day-to-day life, you may suffer from an anxiety disorder. It is advised to discuss with your doctor about all the potential causes and available treatments for your anxiety. Your GP will likely recommend trying non-drug approaches before opting for a medicinal treatment, such as beta-blockers. Using a beta-blocker should only be considered after all the potential risks and benefits have been thoroughly explained to you. How is Performance Anxiety treated? Before opting to treat performance anxiety with medication, it may be recommended to attempt non-drug approaches first. This can include cognitive behavior techniques that aim to help the sufferer manage their performance anxiety. These techniques can include performance practice, as the associated anxiety may stem from not having mastered the required skills. Meditation is another technique that, for some, has proved beneficial. It works by clearing the mind and regulating breathing. You can also consider using online mental health services, which, in some cases, are available on the NHS. To find out more ask your GP or mental health professional for further information. If these techniques prove unsuccessful, using the beta-blocker Propranolol, may be recommended. 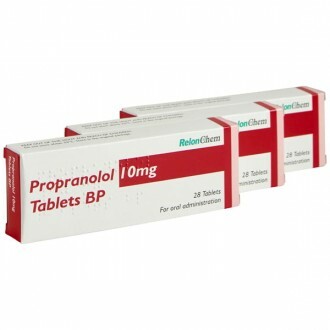 Beta-blockers, like Propranolol, are generally used to treat hypertension, heart conditions and certain types of tremors. In some cases, a beta-blocker can also be used to prevent migraines. However, Propranolol has proven highly effective in helping to manage the symptoms of performance anxiety. If taken an hour before performing, Propranolol will reliably ease symptoms, such as a pounding heart, and trembling voice or hands. Other beta-blockers are not appropriate for use to help treat performance anxiety as they work in a different way, making them less effective. If using Propranolol to treat performance anxiety, the risk of experiencing side-effects is low. This is due to the medication only being used intermittently and at lower doses when compared with treating other conditions. Can Performance Anxiety be prevented? Preventing performance anxiety isn’t always possible. However, practicing the non-medicinal cognitive behavior techniques is often the most effective form of prevention. If the anxiety relates to a lack of confidence, practicing the upcoming performance will help build confidence and reduce the associated anxiety. As your confidence builds, begin to introduce a small audience into your practice by using friends or family. Using breathing techniques and meditation will relax the body and mind, which will help lower your heart rate and control your breathing. Performance anxiety can be characterised by an elevated heart rate and rapid breathing. By practicing techniques that aim to regulate both breathing and heart rate, when a performance looms you can employ these techniques to help keep your anxiety at bay. Stress and Relaxation Techniques: Relaxation techniques can produce moderate short-term reduction of anxiety in people with long term health problems. These techniques have been shown to be effective for older adults suffering with anxiety. Yoga: Yoga, which is a combination of physical postures, breathing exercises, meditation, and a distinct philosophy, is one of the top ten practices of CAM (complementary and alternative medicine). It may also help reduce anxiety and depression. Acupuncture: Evidence for the use of acupuncture, a Chinese practice of inserting needles into the body at specific points to manipulates the body's flow of energy — to treat anxiety disorders is becoming much more common. You could also try "talking therapy" speak to your GP and they can let you know what's available locally to you and help decide which treatment would be most effective for you. There are many over the counter products that you can purchase at your pharmacy. Some include; Kalms, Rescue Remedy and even vitamins such as St. John's Wort.